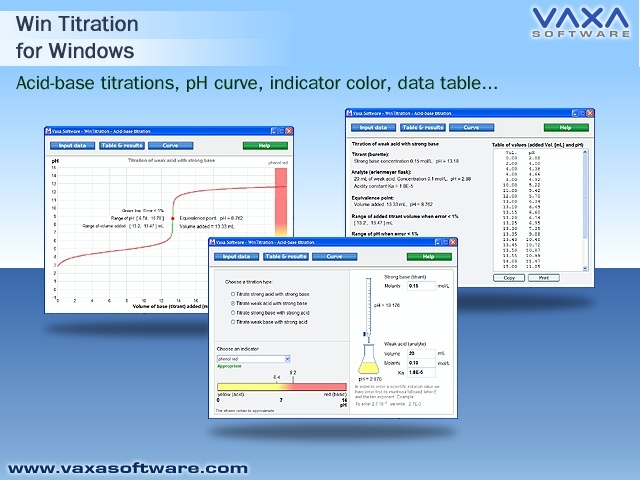 WinTitration - Acid base titration equilibrium with pH curve and color indicator variation. 4 types of valoration: Strong acid with strong base / (*) Weak acid with strong base. (*) Strong base with strong acid / (*) Weak base with strong acid. (*) Only available in the registered version. 27 indicators: We can choose 27 indicators (including 10 fluorescent indicators). List of indicators: alizarin yellow R bromophenol blue bromothymol blue phenolphthalein m-cresol purple methyl orange bromocresol purple congo red bromophenol red cresol red phenol red methyl red neutral red thymolphthalein litmus methyl violet 4-dimethylaminobenzol (F) esculin (F) beta-naphthylamina (F) alpha-naphthylamina (F) fluorescein (F) eosin (F) eritrosine (F) acridine (F) umbelliferone (F) coumarin (F) beta-methylumbelliferone. NOTE: (F) = Fluorescent indicator For each chosen indicator the acid and basic color is shown. We can print table of results and pH curve Easy and fast to use. User's manual in PDF format.